Ecoed friends keychains made from upcycled wooden wine boxes! 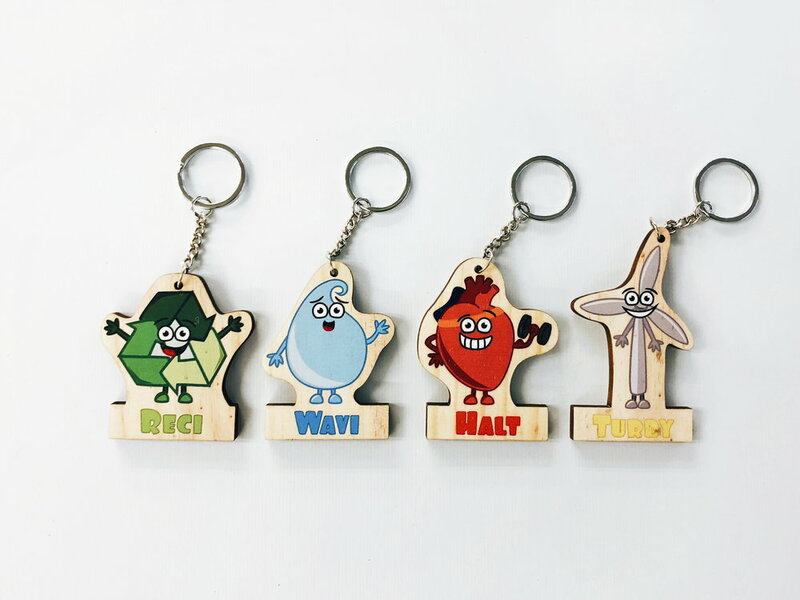 The purpose of doing the Ecoed characters keychains was to, on one hand, capture the essence of what Ecoed is - a fun, light, yet conscious raising and important initiative around increasing awareness, education and action in the field of sustainable living -. On the other hand we also wanted to provide a nice 'perk' that could act as a daily reminder of our main ethos and message: our day-to-day consumption habits and choices matter, and each of us can make a difference, by taking action. The transition towards a more sustainable way of being and living starts with each one of us, at our homes, offices, schools, and everywhere we go, by changing that which is within arms’ reach - our own personal daily habits. Lastly, the keychains are a living example that products can be produced in an environmentally friendly way, following the principles of a circular economy and materials that have been recycled and can be recycled in the future. The wood used is recycled and the choice of aluminum over plastic for the actual keychain was driven by the high recyclability of the former over the latter. It is our ambition and hope that we see more and more people out in the streets, with their Ecoed keychains hanging from their bags and purses, carrying the #ecoedattitude with them, wherever they go: not just the keychain of course! Take your Ecoed friend with you, and your #ecoedattitude also… Always!